There are times that bring a deep and compelling urge to say something profound—like when we first behold our newborn child, or when we gaze at some astounding natural phenomenon like the Grand Canyon for the first time, or when we look into the eyes of someone we love in ways that words can’t begin to touch and see a reflection of our own heart looking back. Times like that cry out for something far more than we are capable of producing, and yet, in spite of our hopeless incapacity, they will not let us abandon the effort, so we fumble about in our pitiful repertoire of linguistic tools looking for something to say that feels less than insulting to the moment. these events, and together they define the essence of all that is vital and profound. The events of Easter propose questions that we egocentric human beings are generally too proud, too arrogant, and too self-serving to honestly consider, so we casually dismiss them as irrelevant. They also hold answers to questions that are deeper than most of us have the wisdom and understanding, not to mention courage, to even ask. Yet here I am again, caught in the vortex of an irresistible urge wrestling with an impossible task. But with appropriate disclaimers in place, I would like to suggest that we consider again, not just what He did, but what it means, and where we fit, if we fit at all. For instance, if Jesus’ resurrection was a victorious event, and it surely was, against whom, and over what did He prevail? If He engaged an enemy on the cross, who or what was it? 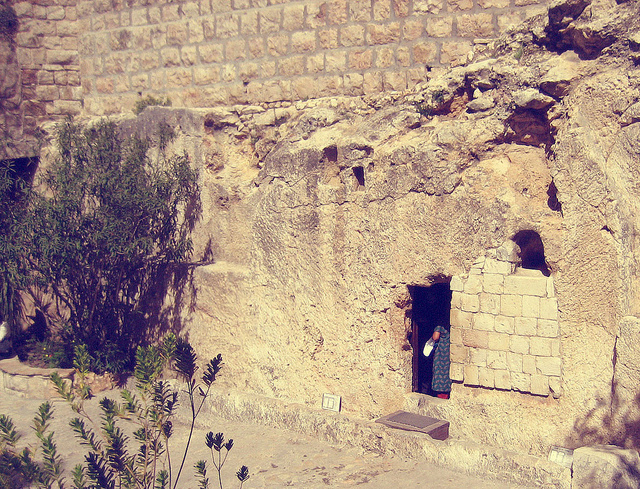 If His resurrection was indeed triumphant, what force opposed Him, and in what way did He overcome? In reference to what, exactly, do we raise our praise songs of victory and triumph every Easter? And what does any of it really have to do with us? During almost every ‘Passion Week’ celebration, I hear someone make a comment about Jesus victory over ‘death, hell, and the grave’, and His struggle against that trilogy of enemies. But does that comment miss something? Suppose the real conflict was not against any of them directly. If Jesus’ opponent on the cross was death, and if He won, then how is it that He died? If His fight was against the grave, then how is it that He had to occupy one? If His conflict was against the reality of hell, and if He won, then how is it that He had to endure its multitudinous agonies? Clearly, God’s eternal adversary, Satan, was involved, but Jesus’ real enemy on the cross was the one common denominator that brings each of them together, and the thing that allows them to even exist. The enemy is sin itself. The cosmic war that culminated in that decisive battle on the cross began long ago, quite literally, in the beginning. Sin—as a concept, as an individual act, and as an unavoidable and inescapable human characteristic since the fall in Eden, has always been the separating issue between God and man. Satan was surely the instigator, and continues to be, but sin is his objective, his only lethal weapon, and the core of all our conflicts with God and each other. Death has always been the consequence, and continues to be, but sin is the factor that allows it. Hell has always been the final repository of sin’s prey, but it is sin that confines its residents there. Jesus’ enemy wasn’t death. His adversary wasn’t the reality of the tomb, and His persecutor on the cross was not hell’s fire and brimstone. It was sin – and not just sin as a detached theoretical concept. It was sin in its destructive personal power, with all of its terrifying individual torments that afflicted Jesus on the cross. The sobering truth that confronts us is that it wasn’t His personal sin, because He had none. It was ours—placed on Him by the Father, in order to give us hope. Jesus won that battle because He took everything sin could generate—every disappointment, every loss, every humiliation, every heartbreaking betrayal, every cruel abandonment, every level of hopelessness and despair, and every dark specter of isolation and loneliness, every searing physical pain. He took it all. He absorbed every weapon in sin’s arsenal, weapons meant for us, weapons loaded with ammunition we provided. The battle was not over until sin had been emptied of everything it could hurl at Him. He declared it finished when there was no fight left in His opponent. Then He died, and was buried to seal the reality of death, and to confirm its final authoritative role. Then, in exact accordance with His promise, He arose! And sin was powerless to stop Him. The grave was powerless to keep Him, and the vindicated righteous Law of God, left hell powerless to claim Him. Now, He lives, and stands in absolute, undisputed, and eternal victory over sin, and all of its cohorts. And now, in a display of love and grace as astounding as Jesus, Himself, we have a personal invitation to be included as though we were with Him, as though we were in Him in everything from Calvary to resurrection morning. Opening our hearts to Him does more than affirm our agreement with His teaching; it forms a relationship that unites us with Him, and that makes every triumph of ‘Passion Week’ as much ours as His. The issues and questions about Easter’s events are not just rhetorical. They are as deeply personal as our own list of sins. There is no personal access to His triumph without first joining Him in the warfare on the cross. If there is no personal connection to the sin against which He struggled, and no realization that the torture He endured was justifiably ours, then there can be no personal connection to His resurrection either. Without both, we are left with a war we cannot win, and Easter holds no benefit, in which case it might as well be what it has become for so many – nothing more than pointless clichés, fictional rabbits, sugary confections, and plastic eggs. This entry was posted in Devotional, Easter, Faith, Family, and Culture, Forgiveness, Holidays, Insights, Wake Up Calls and tagged Easter, resurrection. Bookmark the permalink.